On April 17th, 2019, the Zimmerli Art Museum will become a hub for art and science collaboration as the host of LASER, or Leonardo Art Science Evening Rendezvous. These International meetups are a platform for cross-disciplinary exchange and collaboration across the arts, sciences, and technology. Rutgers LASER aims to illuminate the extraordinary research and applied practice taking place across New Jersey in our laboratories, art studios, and classrooms. This LASER Talk will bring together students, artists, researchers, and the greater campus community to consider the theme of "Living Laboratories." Rutgers defines living labs as "any productive/educational use of the campus landscape." We will explore the concept of expanding learning landscapes through creating opportunities for learning, research, and action beyond the classroom, incorporating environments such as gardens and collaborative studios. Focusing on the nexus of art, science, and technology, the evening will consist of lightning talks and a Q&A conversation with RU innovators focused on encouraging experience-based learning and fostering sustainability through the implementation of living labs. Jennifer has been a practicing designer and educator for over twenty years. Prior to joining Rutgers, she taught for 12 years and 4 years respectively at The University of the Arts in Philadelphia, and Pratt Institute in the Graduate Communications Design Program. At Rutgers, Jennifer is also the Co-Director of Visual Means and the Design Consortium, two Resident Partners at Express Newark who focus on collaborative engagement through design education. Jennifer is also the Principal and Creative Director of her own NYC-based firm, Level Group, that focuses on strategy, branding, and design. Her work has been recognized with awards from Graphis, Core 77, Print Magazine, GOOD Design, GD USA, and Creativity International. University College & Designers Association, and has been exhibited at the Cooper-Hewitt National Design Museum. She has also been an invited speaker at the AIGA/American Institute of Graphic Arts National Design Conference, and the MODE Motion Design Summit. Jennifer holds a B.A. from Brown University, and an M.F.A. in Graphic Design from the Yale School of Art. Holly Grace Nelson is a landscape architect, Associate Professor of Practice and BSLA Program Director. Christina Kauzinger is an ecologist and Assistant Professor of Research. They co-teach Planting Design studio in the Department of Landscape Architecture, using their curriculum to develop a campus network of Living Laboratories. This is an effort of co-creation by students, and staff. It fosters student empowerment and interdisciplinary collaboration, while improving landscape performance and biodiversity. Gardens designed by the class are clustered around the Institute of Food, Nutrition and Health, a campus social hub, to amplify its sustainability and healthy food message and extend it into the landscape. Mary Nucci, Ph.D. is an Assistant Research Professor in the Department of Human Ecology at SEBS. Mary developed and directs the Minor in Science Communication and the forthcoming Minor in Science Outreach, and is one of the three founding members of the Science Communication Initiative, a network of Rutgers faculty, staff and students interested in promoting science communication teaching, research and outreach at Rutgers. She developed the SEBS Science Cafe Series and the Alternative Science evenings. Her research has examined how science is communicated in mass media and informal education institutions. In her courses, Mary aims to change the way we teach science communication, incorporating active learning within and outside the classroom spaces. She has an AB in Biology from Mount Holyoke, an MS in Zoology and a PhD in Media Studies, both from Rutgers University. 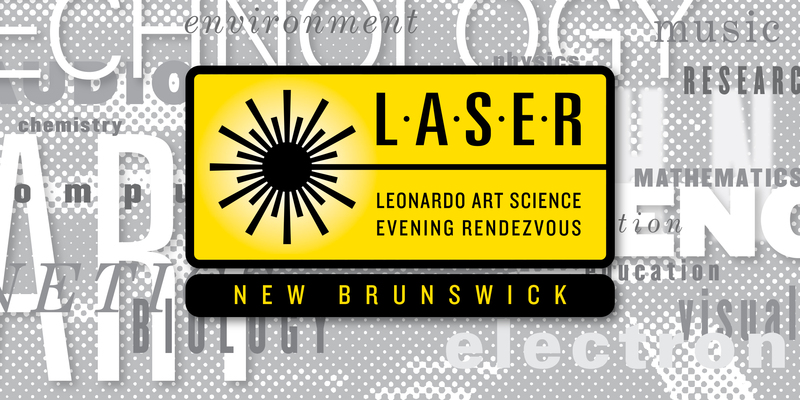 New Brunswick Leonardo Art Science Evening Rendezvous (LASER) is a initiative of Leonardo/ISAST and is an international program of evening gatherings that brings artists and scientists together for informal presentations and conversations.